Annual Comprehensive Financial Review: Your Personal Retirement Plans are reviewed and updated as needed. We also review all areas of your personal situation to account for any changes to be sure you are on track. Matching personal changes/desires and investments adjustments go hand in hand. 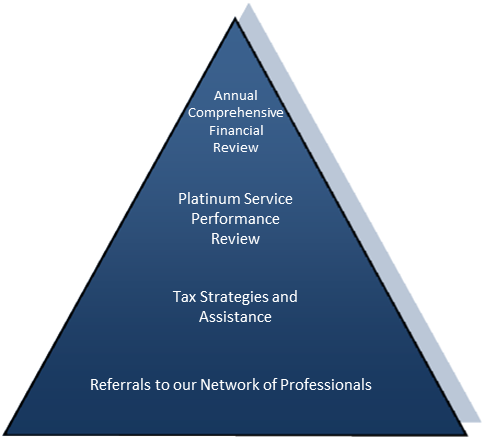 Platinum Service Performance Review: Quarterly, we will mail you performance reports and discuss any changes or updates to your current situation. Annually, your overall investment performance is measured and compared to your financial goals. Tax Strategies and Assistance: Offsetting capital gains and losses “tax harvesting” to help with tax efficiency as well as additional assistance obtaining needed documents for your accountant. Referrals to our Network of Professionals: Estate Planning Attorney, CPA, Insurance Representatives, Document Review by Available Attorney.